A while back, my local newsagent stocked Patrones magazines. Sadly, they can no longer get them, but I did buy a few copies when they were available. I love Patrones patterns as they tend to be stylish and current. 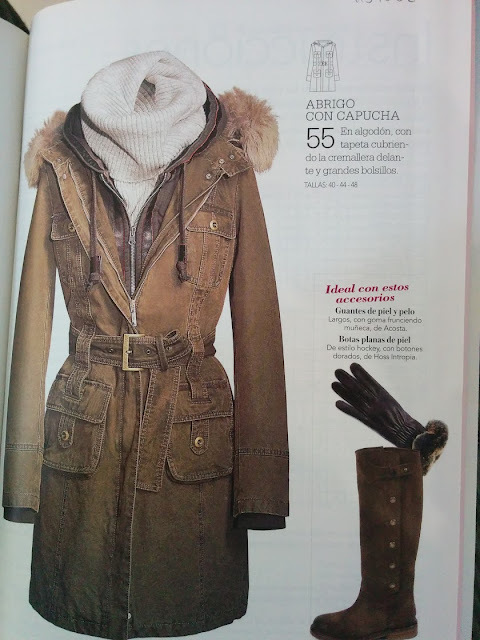 They also offer lots of new designs in every issue, unlike the repetition we often get from Burdastyle. 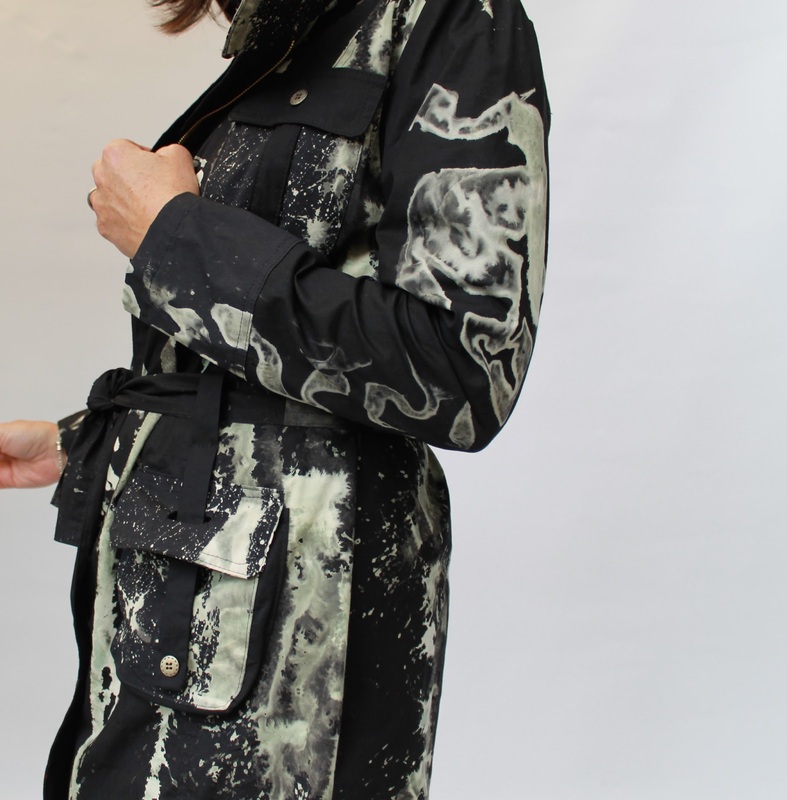 Issue 34 from a couple of years ago was bursting with gorgeous coat patterns and I fell in love with this military-style trench coat. Ever since then I have been waiting for the right fabric to make one. I was after ripstop cotton, recommended by Carolyn for her army jacket and apparently occasionally available in Spotlight. However, many trips to Spotlight and elsewhere failed to locate any and I grew increasingly despondent. 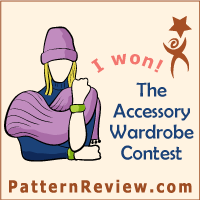 That is until I won a voucher for Fashion Fabrics Club, an online store in the US, in the Pattern Review Jeans Contest. Ripstop cotton was my first search and they had it! I bought some in green and orange. I also bought a few other things and spent far more than my voucher value! Note to international buyers: the postage was exorbitant (US$135 for this order, yes you read that correctly) and the amount is not calculated until after the order is packed. Also, the website doesn't tell you, but it only takes US credit cards so you need to phone in your order sometime during the early hours. 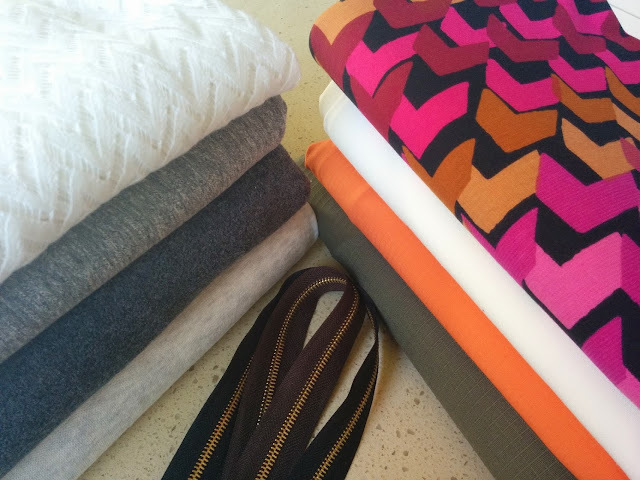 Despite these drawbacks, I am thrilled with all my purchases and have already made some things. 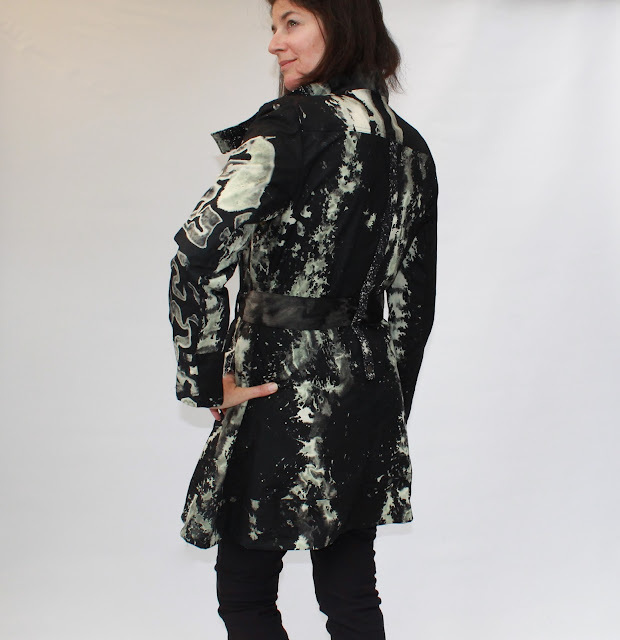 Anyway, back to the coat which is not made from any of the above fabrics. Sorry! This is my wearable muslin for the real deal made from the olive green ripstop cotton. I don't usually bother with a muslin, but since I was getting the fabric from overseas and it cost more to post than to actually buy AND given that the instructions were in Spanish, I thought I'd better have a practise first. 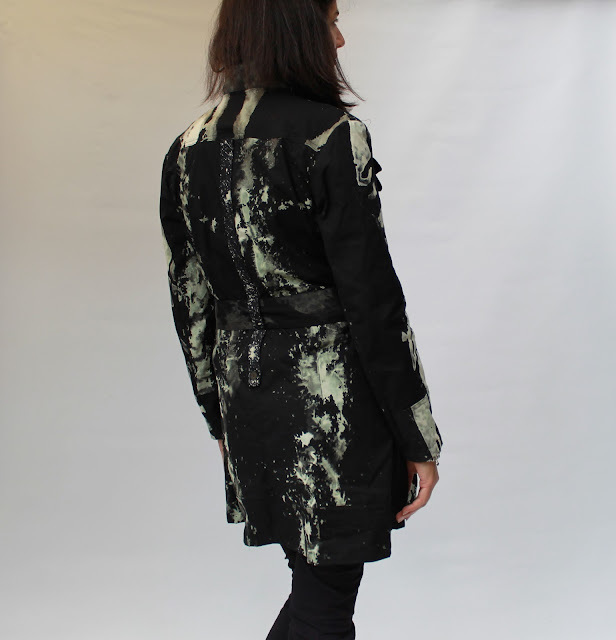 This coat is made using some black stretch woven, possibly bengaline, with bleach spatters all over it. I bought this at a designer fabric sale because, although it came as lots of oddly-shaped pieces, I thought it looked cool and interesting. I love a good rummage at a designer sale (thanks Bronwyn for the fun outing). It took quite some time to cut out this coat in the end because the pieces were often not quite big enough for my pattern pieces. I did have to sew some together to fit everything on. Luckily the bleach splatters hide the joining seams quite well. My previous attempts of typing Patrones Spanish instructions into Google translate have yielded hilarious but wholly unhelpful results. I decided this time to just work this out myself. The only things I did translate were the names of each pattern piece, which did help a lot. However, let me just say that 15 pattern pieces plus several strips of fabric for the belt, tabs, facings etc. did not make for a stress-free, instruction-free construction experience. Unsurprisingly, I got myself into quite a muddle involving jettisoning the hood through the nearest window and redrafting the collar to fit the ever-widening front sections. When I had finished the entire jacket, I realised that the front was too wide as I'd done something weird with the zip plackets. This is difficult to explain, but I think I know what to do next time. The picture below has the zipped-up front folded over itself at the top as it's so wide. I'm choosing to ignore this problem. Anyway, focussing on the positives, I was pleased with the way the pockets turned out. I love the long tab that runs from the upper to the lower pocket, feeding through a welt hole in the lower pocket flap. And the matching tab at the back, forming the belt carrier. The bleach effect was varied and interesting and I like how it looks. I tried to match the different bleach patterns a bit like here on the sleeve and cuff. 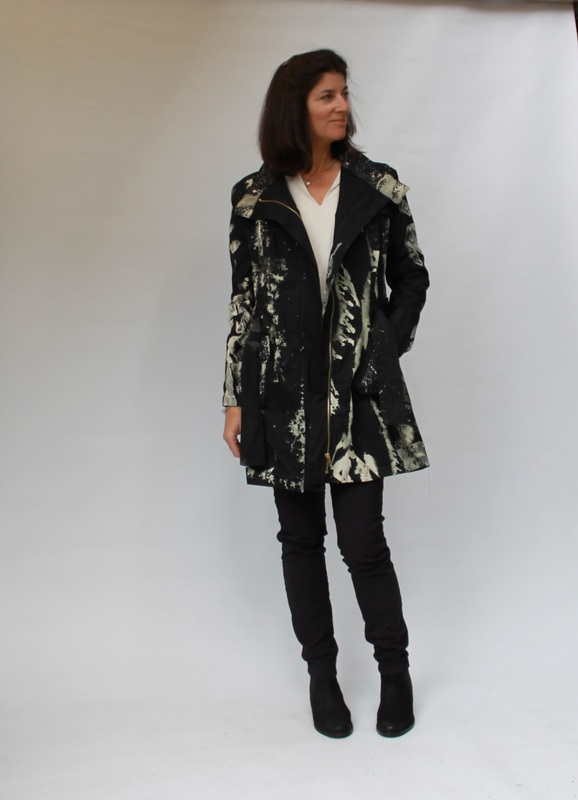 The coat is a perfect fit (apart from the wide front) and is super-comfortable due to the stretchy fabric. My ripstop has minimal stretch so I may need to allow for this in the next version. Can you spot some fabric piecing in the pictures above and below? Hint: at the hemline. Making this involved some swearing and seam ripping but I got there in the end and learned some useful lessons about jacket construction. I've made several notes for next time and I've been working on some less-taxing projects as I psyche myself up for the next attempt at this coat. I actually really love this version and have worn it out a few times already on cooler evenings. Worn here with StyleArc Elle pants (unblogged but I just love these) and Seed boots. That looks fantastic! I had to laugh when you posted about trying to translate using Google. While on vacation in Italy, my family had some great laughs trying to translate Italian menu items to English. It made for interesting meal choices. ha ha I have seen a couple Patrones makes and really like the style. Eventually I will purchase one. 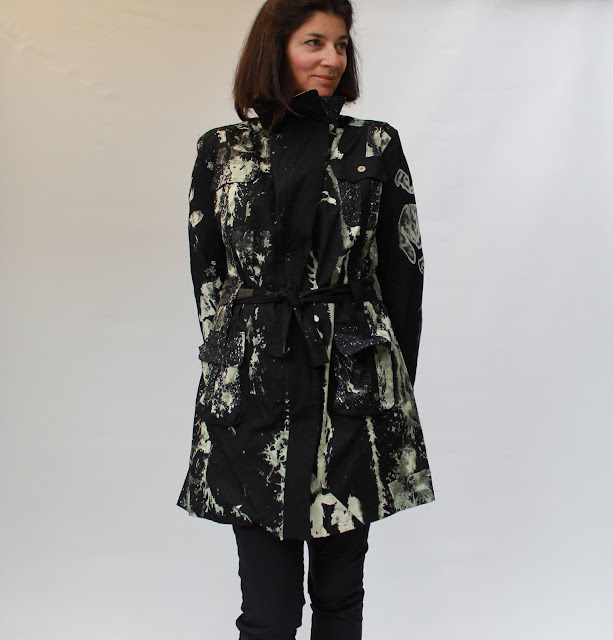 This was quite adventurous of you to take on a complex coat pattern in a different language! Living in Germany, I have had to translate a couple Farbenmix patterns, so I know how slow going that can be. Oh and that shipping cost! WOW! That is crazy expensive! I agree! Google translate is amazing, but definitely has its drawbacks. Although this was difficult without instructions it was worth it. I studied the picture very carefully! Despite the issues you mentioned, your jacket looks fantastic! I know what you mean about taxing projects as I am forcing myself to complete one at the moment which is taking way longer than necessary. Thank you. Yes, sometimes difficult projects can become a bit of a chore, which is a shame. Luckily that is mostly forgotten when it's finished! Your Trench coat looks fabulous and I really admire you attempting a Patrones pattern that speaks no English. I have a few Patrones magazines but have been reluctant to use them. You said that your Trench fitted well so were the Patrone's measurements accurate and spot on?? I will look forward to seeing your next Trench in your lovely Rip cotton. You should definitely give Patrones a go. The sizing was spot on. You've got more than enough experience to make something without instructions. Just make sure you know which piece is which before you start. Thanks Megan. I will get those magazines out again and choose a pattern. Let you know how it goes on IG. That's a very cool jacket. 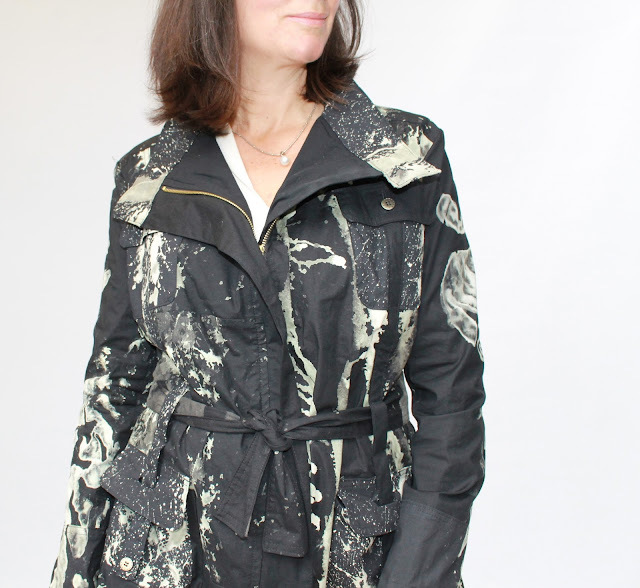 I'm a bit fond of splatter print myself. Thank you. All the splatter without the mess of having to do it myself - win! That is such a great jacket. I like the style of it and the fabric is utterly amazing. Wow - just wow. What a stunning coat. I wouldn't regard this as a muslin going forward! Grr, I keep losing my comments. 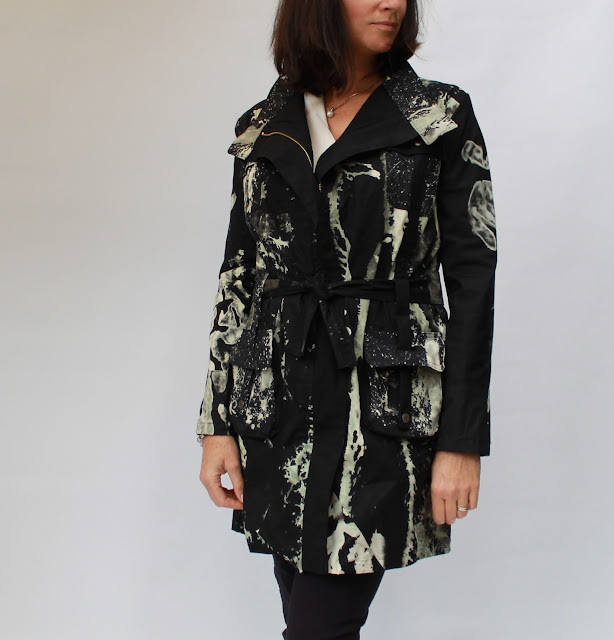 Basically, this is an awesome coat, I love the cool fabric and am feeling deep envy. Looking forward to seeing the next one. Wow! 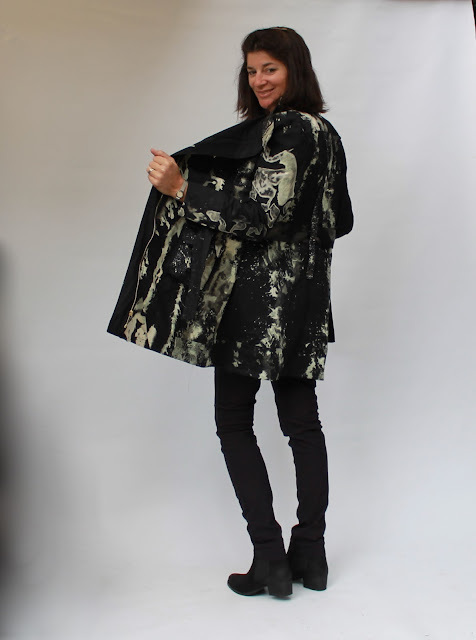 Amazing coat! I just love that bleached fabric and didn't notice the piecing until you pointed it out. 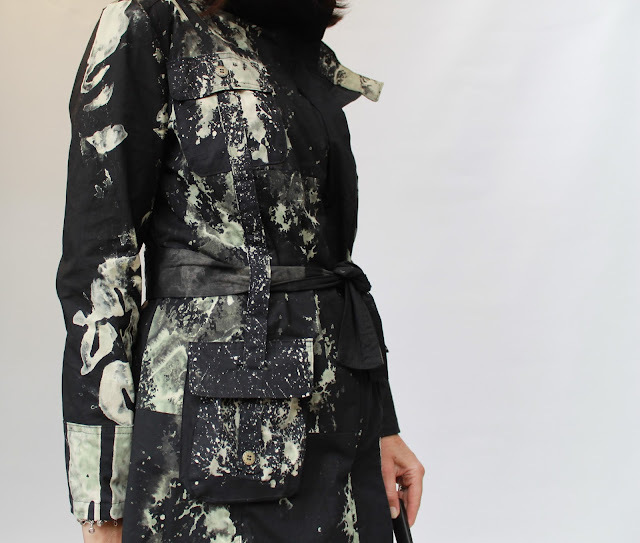 I really like the design of the coat- the pockets are great. I'll have to look out for this magazine and get my mom to translate for me. Can't wait to see the ripstop version! This is a fabulous looking jacket. Well done. Lovely fabric and top notch skills transformed this pattern into an avant-garde jacket! I would so wear it!!! I love it. I'm going to have to hunt down that issue. I have a few Patrones and after a hilarious round with google translate, I've had several people who are fluent in Spanish look at it and they can't figure it out either. I love the fabric and can't wait to see the one in the ripstop. I just bought a big lot of Krytek ripstop for some backpacking clothes and if I have any leftover a jacket like this may be something to think about. GORGEOUS coat Meg! I'm super impressed! Oh. My. Madam, you have out done yourself. This is really a step above and beyond Fab.U.Lous. Your deserve cocktail service for having to endure that seam ripping and top stitching.